Spring bird migration was off to a late start this year, but with the recent change in the weather, migrants have been passing through in droves. Wednesday I was out with a bird club friend and we counted almost 60 species in three hours. However, our morning of bird watching was cut short when we noticed a male Wood Duck trying to walk across the gravel path. He appeared to be in trouble. Wood Ducks are shy birds that prefer to hide in wooded swamps and freshwater marshes. When they see people they quickly swim into the marsh or fly away. This bird was walking towards us and appeared to have a problem with his wing. When we approached him, he couldn’t fly away. The bird looked exhausted and let us pick him up with little resistance. Since he was suffering from some kind of injury, we knew we couldn’t leave him there and a rescue was in order. 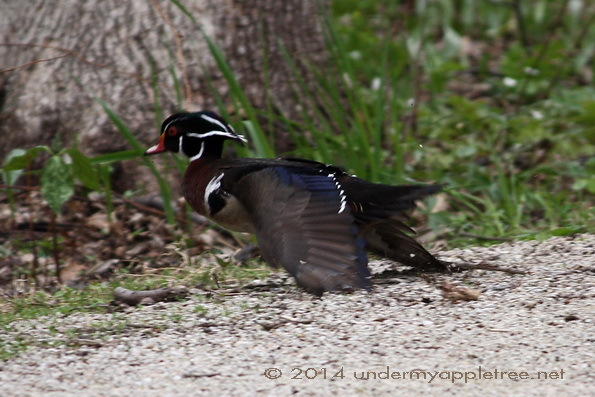 This is the closest I’ve ever been to a Wood Duck, so I couldn’t resist a quick photo of this beautiful bird. We took him to Willowbrook Wildlife Center, a rehabilitation facility that provides care and medical treatment for injured and orphaned wildlife. When we arrived at the facility we found that it had been a busy morning with many birds being brought in for treatment, mostly from collisions with buildings along the Chicago lakefront. Today is International Migratory Bird Day, an annual event that highlights and celebrates the migration of nearly 350 species of migratory birds between nesting habitats in North America and non-breeding grounds in Latin America, Mexico, and the Caribbean. Many events and programs are taking place today. I will be out with a group of birders exploring a golf course and searching for migratory birds as part of the Illinois Spring Bird Count. Volunteers across the state will tally species and record the number of birds seen or heard. Early May is near the peak of migration, and the goal of the count is to obtain a snapshot of the migrating species as they move through the lower 48 states. What a gorgeous fellow he is, I’m so glad that you were there to save him. Did you find out what was wrong with him? I saved a bird this week, a crimson rosella, but she was not nearly so grateful and I have savaged hands to show for it. You’ve done your good deed for the day by saving that lovely bird. The Illinois Spring Bird Count sounds like a worthwhile (and fun!) endeavor. Enjoy the day! 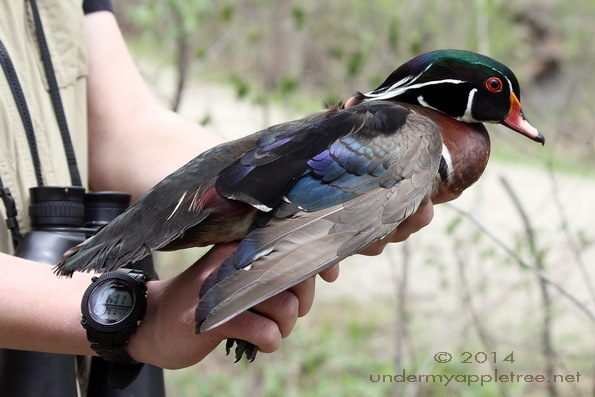 Wood ducks are such beautifully marked creatures. What a blessing that you were the human he chose to help save him. Wood ducks are so beautiful. What a great shot and rescue story. Poor little fella. Lucky you guys came along. Will he recover? Lovely post and rescue story, Leslie. I hope this sweet bird will be okay. Lovely photo. What a lucky duck that you found him and knew what to do. I’m so glad you were there at the right time to help that poor duck! Did you find out what was wrong with the wood duck? It makes me happy that people like you are willing to take time out of your day to help an animal in need. Thanks for sharing the story. We were out on Magee Marsh around Lake Erie and saw a ton of warblers. Congrats on seeing so many species in Illinois!